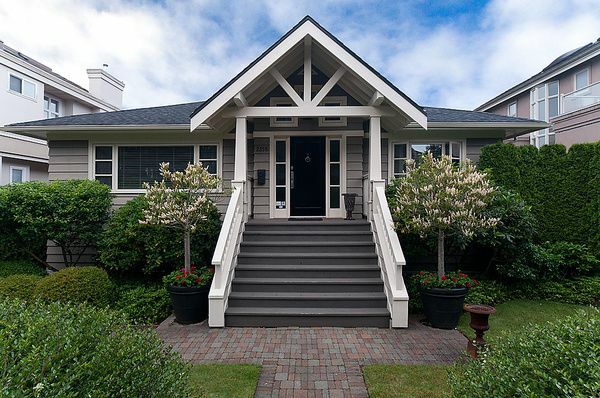 Stunning home tastefully renovated w/incredible attn to detail. Exquisitely designed & finished w/the finest of quality including rich h/w flooring, imported stained glass windows, one of a kind antique f/p mantle, wood windows & blinds &custom millwork w/built-ins & window seats. Main level offers fabulous flr plan w/cozy famrm & eating area off kitchen & dining rm. Lrg master retreat & gorgeous ensuite w/classic timeless details incl canterra stone counters. Lower level is attractively finished w/recrm, 2 lrg bdrms, easily suited. The superbly manicured garden is delightful & incl all pots & is sprinklered. Fantastic quiet location on lovely tree lined street close to Trafalgar & Prince of Wales schools, UBC, & transportation.